Harriet Anena, a Writer and Blogger Becomes First Ugandan to win the Wole Soyinka Biennial Writing Prize for Literature, Awarded to theCcontinent's Best Writers. Harriet Anena has broken the record to be the first Ugandan to win the biennial writing prize, awarded to the continent's best writers. From a total of 110 submissions from 11 nations in Africa, two works of poetry stood out this year. One of them is by a Ugandan - Harriet Anena. 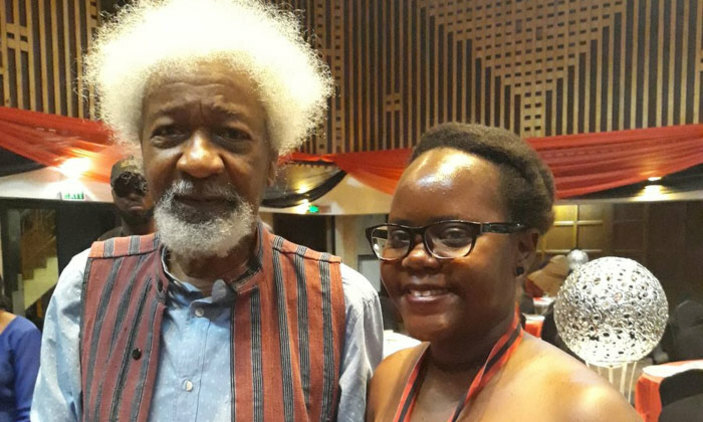 After being announced joint-winner of the 2018 Wole Soyinka Prize for Literature in Africa on Sunday, Anena was delighted at her achievement and later tweeted saying she was "super happy". Her work of literary brilliance, A Nation in Labour, originally published in 2015, saw her share the top prize with Nigerian poet, Prof. Tanure Ojaide, for his piece Songs of Myself. 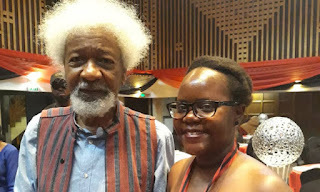 And the man himself, Wole Soyinka, to whom the award is tributed, was present at the ceremony in Lagos to present the joint winners their accolades. Soyinka, an octogenarian with a distinctive Albert Einstein-sque grey afro, is a master of the craft. Many of you can immediately relate with some of his work, including The Lion and the Jewel (play), Death and The King's Horsemen (play) and The Interpreters (novel). He was the first African to be awarded the Nobel Prize in Literature (in 1986) and is a renowned author, poet and playwright. For his extensive work in the world of literature, the Lumina Foundation established the Wole Soyinka Prize for Literature in Africa in honour of the revered Nigerian writer. Every two years, the prize, worth $10,000 (about sh37m), is awarded to the best literary work produced by an African. And for the first time since its inception in 2005, a Ugandan - in the form of Anena - has won it. Last month, Anena, who hails from Gulu, made the cut after 110 entries were chopped down to nine. The list was later in November narrowed down further to three. It is from this cast of three that the jury decided that Anena and Ojiade were equally deserving of this year's top honours. The only other time the prize has been shared was in 2010, when South African Kopano Matlwa (Coconut) and Nigerian Wale Okediran (Tenants of The House) emerged joint winners. Anena, also a blogger, is the first Ugandan to win the writing prize, and will relish sharing the same space with the Nigerian and South African writers that have won it before. But Anena's rise to the top should not be a surprise. Her Dancing with Ma made the shortlist for the Commonwealth Short Story Prize in May this year. Last year, she was on the Top 21 list in the Short Story Day Africa Prize for her work Waiting. Anena's award-winning A Nation in Labour has been described as "a collection of social conscience poetry that paints a picture of the giant politician, the restless citizen, theclueless youth, those struggling to heal from life’s scratches and the ones hunting for words to describe fiery flames of affection".